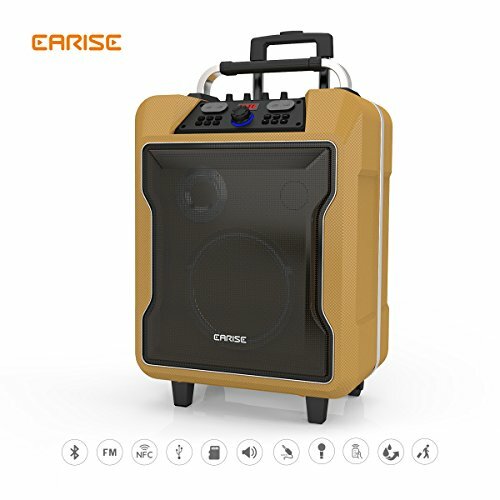 EARISE M60 Multifunctional PA System, portable and flexible speaker with wheels, easy to go anywhere you want, makes all the gathering, parties or game play can be a special and unforgettable occasion that filled with your favorite music! It is powerful and loud enough to make the places from the house to the field filled with clear music, a must-have for any important and casual occasions which needs the background music such as wedding, parties, family BBQ etc. With EARISE PA System and the wireless microphone, never be unheard again, just be your own announcer! Dimension (L x W x H): 16.7"x11.5"x25.2"
Charging is needed when the battery symbol is empty and twinkle, and the M60 will automatically enter in low power self-protect state and the volume will drop 70%. ♪ Powerful Battery- Built-in rechargeable battery provides long continuous use up to 50 hours. A full charge goes a long way lasted the whole day. ♪ Multifunction-Easy Connection to Bluetooth, support connection with NFC-enabled smartphone with a single tap and AUX, TF/USB input, FM Radio. Works with all of your favorite devices. Very easy to sync and operate. ♪ Rolling Speaker- Telescoping Rear-Handle and Wheels, easy to get from place to place. No need to use both hands to carry it. Enjoy your favorite music everywhere as you like. ♪ Powerful Speaker- Loud and clear enough to play in open air and make people dance, adjustable volume for regular use to make your house or bedroom filled with wonderful music. You decide how loud it needs. ♪ Remote Control & Wireless Microphone-Get rid of keeping near the speaker to control the volume, just control it as you like. Wireless microphone makes your presentations successfully with more interaction with audience.